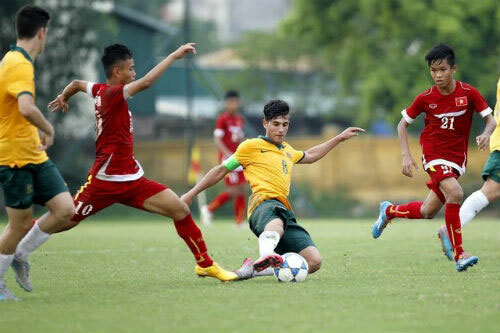 Vietnam is to play Australia on July 23 in the final of the ASEAN U16 Football Championships after they defeated the host Cambodia 1-0 on July 21. 50,000 football fans filled up the Olympic Stadium in Phnom Penh to watch the semi-final. Khac Khiem opened the score line for Vietnam in the 27th minute with a close-range finisher after a free kick setup from outside the box. Cambodia sped up the pace of the game as they were mounting attacks in hope of finding an equaliser. However, Vietnam’s goalkeeper Huu Tuan denied the host’s numerous attempts at goal with his superb performance. Australia secured a place in the final after an intense 90-minute (3-3) and a penalty shoot-out (5-3) versus Thailand in the other semi-final. Vietnam beat Australia 3-0 earlier last week in their clash during the group stage./.